Sangria (Spanish: sangría; meaning "bloody") is a wine punch typical of Spain. Because of the variation in recipes, sangria's alcoholic content can vary greatly. The ingredients in sangria vary, particularly in the type of fruit used, the kind of spirits added (if any), and the presence or lack of carbonation. 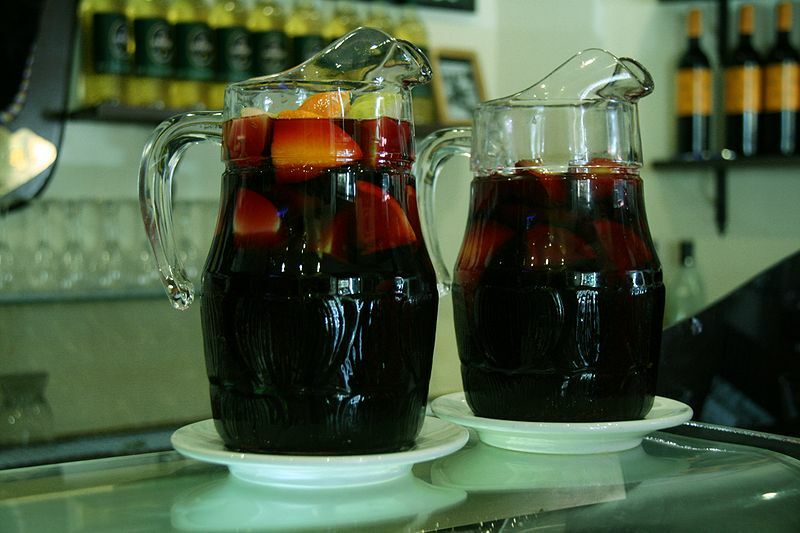 Left: Pitchers of Sangria ready to be served. and ice and carbonated soda, in some recipes. White wine can be used instead of red, in which case the result is called sangria blanca or, as in Argentina, clerico. An affordable bottle of unoaked, fruit forward Chardonnay would work well here. Some recipes that use heavier reds can be lightened by mixing a bottle of white in the mix. In some parts of Northern Spain, sangria is called zurra and is made with peaches or nectarines. In most recipes, wine is the dominant ingredient and acts as a base. In some regions of Portugal, cinnamon is also added with the sweetener. Preparation consists of cutting the fruit in thin slices or small cubes, then mixing in advance all ingredients except for ice and carbonated sodas. After several hours, or a full day in a refrigerator to allow time for the fruit flavors to blend with the rest of the ingredients, the ice and any last-minute ingredients are added and the drinks are poured. A non-alcoholic version of sangria is made from wine grapes, carbonated water, essence of lemon, and cane sugar. Sangria is served throughout Spain and Portugal during summer, and in the southern and eastern parts of the countries year-round. In these places it is a popular drink among tourists at bars, pubs and restaurants where it is often served in 1-litre pitchers or other containers large enough to hold a bottle of wine plus the added ingredients. A lid or other strainer for the container helps prevent the fruit and ice cubes from falling into the glass. Among the Spanish, sangria is most typically served at informal social gatherings, much like punch, from a punchbowl. Sangria is often served with a wooden spoon, used to get fruit out of the bottom of the punchbowl or pitcher. Sangria is also commonly served in Mexico and Argentina, and at Mexican and Argentine restaurants. Bottled sangria can be bought in some countries, but this is considered by some to be less entertaining than making it oneself.